MassArt to host Bread & Puppet Residency February 11-21, 2016. Public invited to participate and attend. BOSTON - Feb. 5, 2016 - PRLog -- Massachusetts College of Art and Design (MassArt) will host Bread & Puppet Theater, featuring Founder and Artistic Director Peter Schumann, for an 11-day Artist-in-Residency from February 11-21. MassArt students and community partners will collaborate with the troupe throughout the residency; the public is also invited to participate as volunteer puppeteers and attend the performances. The Bread & Puppet residency at MassArt was established through Academic Affairs, and is co-organized by the Center for Art and Community Partnerships (CACP) and the Studio for Interrelated Media (SIM) academic department with the intention of offering students and community members alike the opportunity to participate in the interdisciplinary residency program in a meaningful way. The residency offers many entry points for artists, designers, and educators to collaborate with the troupe and gain valuable experience. Students and volunteers will attend performances, rehearse and perform with the troupe, assist with production, and document the shows. Through these opportunities, participants will learn what it means to be an activist artist, how to respond to real life issues through the performative process, and how to create work collaboratively with other artists. MassArt students will participate in the residency as independent study with the Studio for Interrelated Media, or through related class offerings such as playwriting through the Liberal Arts department, puppet-making through Fine Arts 3D, or live drawing sessions during the rehearsals. 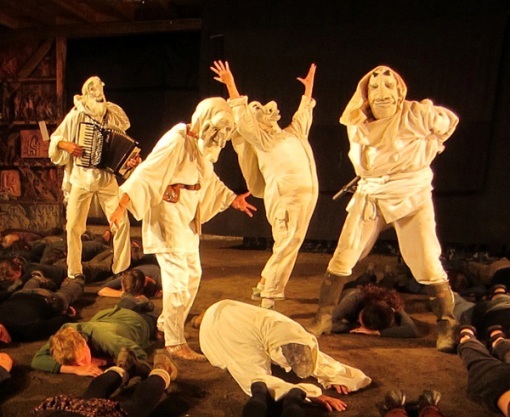 The Center for Art and Community Partnerships is partnering with several community-based organizations to introduce new audiences to Bread & Puppet. Sociedad Latina is a primary community partner for the residency and plans to engage its members through many art forms such as instrumental accompaniment during performances, video documentation of the shows, as well as rehearsals and performances with the troupe. The residency opens with a Fiddle Sermon on February 11, delivered by Peter Schumann, followed by a question and answer session with the Bread & Puppet company, a parade through MassArt’s Design and Media Center, and a reception in Peter Schumann’s exhibit in the Tower Lobby. The residency will continue with two different kinds of performances that feature Bread & Puppet’s signature powerful imagery, masked characters, and giant papier-mâché puppets, The Overtakelessness Circus(February 13-14) andThe Seditious Conspiracy Theater Presents: A Monument to the Political Prisoner Oscar Lopez Rivera (February 17-21). Additionally, Peter Schumann’s political art installation titled North East Kingdom Weapons and Tools for Decapitalization will be on view (February 12-21). Following each performance, Schumann’s homemade sourdough rye bread (spread with garlic-laden aioli), freshly baked in a temporary outdoor brick oven in the MassArt courtyard, will be offered to visitors. Free admission; to attend a performance as a spectator, RSVP at www.massart.edu/breadandpuppet. To volunteer as a performer with the troupe, email breadpuppetlinda@gmail.com. For more information about the Bread & Puppet Artist-in-Residency at MassArt please visit www.massart.edu/breadandpuppet. Now in its 52nd year, the Bread & Puppet Theater is one of the oldest and most unique self-sustaining nonprofit theater companies in the United States. The theater champions a visually rich slapstick style of street theater that is filled with huge puppets made of papier-mâché and cardboard, combined with masked characters, improvisational dance movement, political commentary, and a lively brass band. The New York Times describes the company’s performances as “a spectacle for the heart and soul.” For more information on the theater, visit www.breadandpuppet.org. Massachusetts College of Art and Design is one of the top colleges of its kind in the United States. Founded in 1873, MassArt has a legacy of leadership as the only independent public college of art and design in the country and the nation’s first art school to grant a degree. For more information, visit www.massart.edu. Follow MassArt on social media: Twitter @massart, Instagram @massartboston, Facebook.com/massartboston (https://www.facebook.com/MassArtBoston), and LinkedIn (https://www.linkedin.com/edu/school?id=18491). The Studio for Interrelated Media, founded in 1969, is the first undergraduate interdisciplinary fine arts program in the country. For more information, please visit sim.massart.edu.